Could Congress Abolish Patents and Copyrights? Some people are suggesting that Congress has the power to abolish patents and copyrights in the United States. The argument is that Article 1, Section 8, Clause 8 of the Constitution states “The Congress shall have Power To promote the Progress of Science and useful Arts, by securing for limited Times to Authors and Inventors the exclusive Right to their respective Writing and Discoveries” and whether they exercise this power is optional. This interpretation relies on the idea that when Congress is granted a Power it is unlimited. The United States was founded on the idea that Government power is not unlimited like the Devine Right of Kings. The United States was founded on the idea that powers of government are limited and come with duties, while Rights of citizens are unlimited and do not come with duties. I know this will come as a shock to those people raised on the modern liberal interpretation, which wants unlimited powers for government and sees the Bill of Rights as a list of negative rights – see Barack Obama. Congress, under Article 1, Section 8 also has the power to set “an uniform Rule of Naturalization, and uniform Laws on the subject of Bankruptcies throughout the United States.” This is not optional on the part of Congress, with the power comes the duty to establish these rules. The interpretation of the Constitution that suggests Congress has the option to establish systems to protect inventors’ and authors’ rights is totally inconsistent with the history of the Constitution. 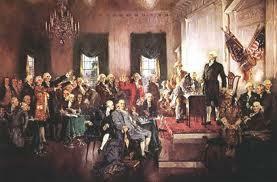 The purpose of the Constitution was to set out the powers of the federal government. Article 1, Section 8 lists the powers but also the responsibilities of Congress. For instance, even the power to declare war comes with the responsibility to do so when the U.S. is under attack from foreign powers. It is well known that the unalienable Rights of the Declaration of Independence are the Natural Rights of Locke – Life, Liberty, and Property. Many people believe that Jefferson changed property to the pursuit of happiness because he was worried it would be interpreted as endorsing slavery. When the Founders used the word “right” they meant natural rights. The purpose of government is to secure these rights. When the Constitution states that inventors and authors have “Rights” in their creations, they mean natural rights and they understood that the purpose of governments was to secure these rights. This means that Congress has a duty to secure the rights of inventors and authors under Article 1, Section 8, Clause 8. If the words patent and copyright are meant as rights in inventions and writing, then it is clear Congress does not have the option of eliminating them. It is also clear that patents and copyrights are not limited by the preamble. Natural rights are not utilitarian, but are endowed on men by their Creator. Many are the times that we are in agreement. However, this is not one of them. There is no such thing as “natural” rights. Try walking unarmed into a den of lions as Daniel did and you will quickly see how the rules of “natural” rights operate. “Rights” are the outcome of civilized men (and women) trying to fashion a “fair” system of nonviolent governance for all. The concept of what is “fair” and what is not has varied over time immemorial. “Fairness” is in the eyes of those who hold power. Congress can easily change in constituency and become anti-IP in place of pro-IP. We are always just one election cycle away from disaster. That is why the fight must go on to keep the jackals of destruction at bay. There certainly is something called natural rights – historically. My argument is completely consistent with original interpretation of the Constitution. Natural Rights is an outgrowth of natural law as opposed to administrative law. Natural law is based on one simple assumption – that a person owns themselves or as lawyers would put it no one has better title to me than me. From this simple proposition flows all of our basic criminal laws (Murder, Theft, fraud) and our basic property laws. You are the owner of something because you created it or you traded something you created for it or your labor for it. If you object that Natural is based on an assumption, so is physics. Physics assumes a well ordered, understandable universe. It assumes that by application of reason and observation we can unravel the secrets of nature. It is also not value neutral – physics is inconsistent with a philosophy of anti-reason or mysticism. Every animal species has a certain set of needs in order to survive that is consistent with their nature. Human beings main attribute is their ability to reason – see Aristotle, man is a rational animal. (This does not mean that every human being always behaves rationally – that is a choice) In order for homo sapiens to survive or more importantly thrive we need a moral and legal code that is consistent with our nature. Specifically, we need a moral and legal code that emphasizes each person’s ability to reason and therefore rejects force among human beings as method of acquiring one’s needs or desires. Where reason is emphasized by the law of a nation, that nation thrives. Patent and copyright laws are one of the most pure expressions of this principle. If you want evidence of this, see the surveys on economic freedom. Those countries with the most economic freedom (rejecting force as a means of attaining your wants) are the wealthiest and vice versa. I’m not worried. Sure they could but why? The system is not perfect but what about all the other countries that have patent laws. They could not without violating the constitution. Have you ever seen the bobbing head dolls in the back window of somebody’s car? They mindlessly shake their heads as a “Yes” and then quickly move on. Well, on C-SPAN Book Review this weekend Maria Bartolomeo (CNBC Business News) interviewed Adrianna Huffington (new book: Third Workd America). They both agreed that America desperately needs to increase/encourage “innovation”. They bobbed their heads, “Yes”. And then they quickly drove onward. Not one mention about the USA patent system. Not one mention about patent “reform”. Not one mention about Congress trying to strangle the Golden Goose (the USA patent system)that got us here. They mindlessly bobbed their heads with a “Yes” motion and then quickly raced onwards to other topics. Apparently all that could be said by these dolls had already been said. I tried to listen to the interview, but it never went anywhere. I am aware that Huffington has been concerned about innovation (invention). They had an article that the US was last in the change in innovativeness during this last decade among major countries. (How about all those qualifiers) The survey they cited is done by Boston Consulting Group and some other group. That is my whole point. They pay lip service to “innovation”. But to them it is just another political buzz word. They have no clue about patents, about inventors, about what it takes to bring a product to market. Like love, it’s just another second hand emotion to them, this “innovation” stuff. Very true – but they always support more money for education. Because Thomas Edison had a phd. Why do people think patents are to protect us from some natural state of imbalance? Without patents there already a natural balance to creating something first. When you invent it first you have the first opportunity to build and sell it. Patents and any government intervention only exists to control that flow. In other words patents impede invention in order to direct it. This is becoming more and more of a general economic burden over time. Let the innovation and more importantly PRODUCTION flow naturally. There is nothing to be afraid of. People will always invent. Having patents did not increase the number of inventions it merely limited who could produce those inventions. You are ignorant of history and the empirical evidence. The rate of invention increased significantly with the introduction of property rights for inventors. Until England provided some rights for inventors people were stuck in the Malthusian Trap. Until the USA provided a rational system for providing property rights in inventions, the rate of technology growth was slow and so was per capita income growth. The countries with weak patent systems or nonexistent patent systems do not invent and their people live on the edge of starvation. You position is so absurd that I would assume you never opened your eyes, but more likely you were blinded by an anti-property rights ideology or an ideology that does not understand property rights.